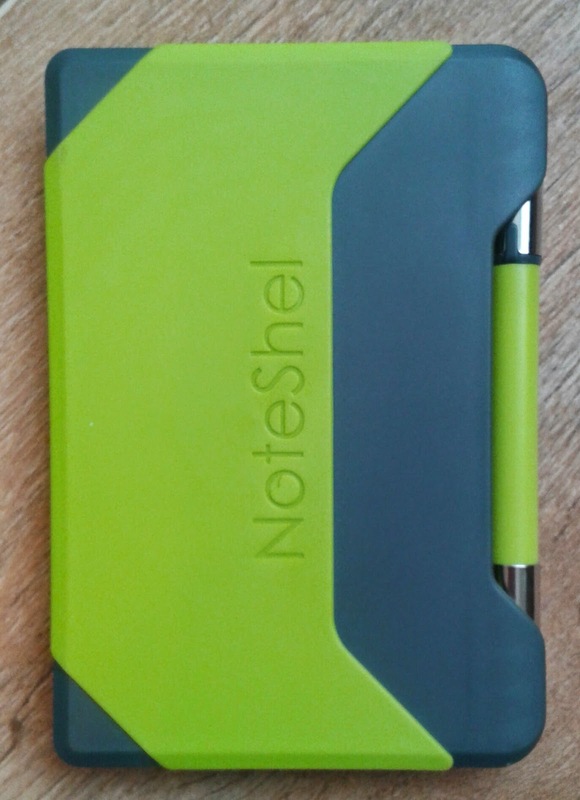 NoteShel Review - An end to my notebook buying addiction? 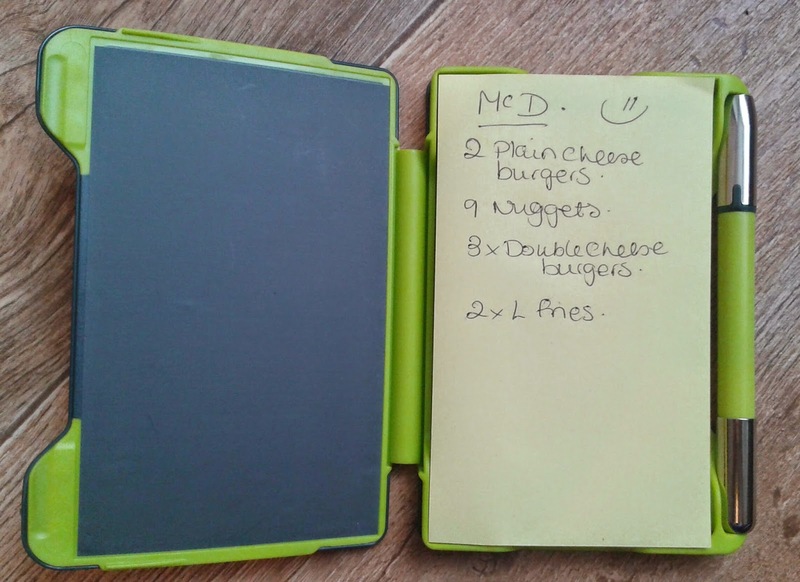 I've finally got my mitts on a NoteShel thanks to a competition on the NoteShel Facebook page. I've wanted a NoteShel for a little while now but with Christmas just around the corner I thought it best to press pause on the stationery spending and start preparing for the big day. It's been tough, like being on a diet. The more I deprived myself the more I craved so hearing the thud as my precious prize dropped through the letter box filled me with excitement. I raced to the door but the Chihuahua had beaten me to it, growling and snapping at my parcel with a crazed look in her eyes. It was then that I realised I wasn't the only one affected by this temporary stationery ban. The dog had clearly missed giving the postman a fright and was making the most of this unexpected visit. I wanted to savour the moment so I opened it slowly, feasting my eyes on the vibrant colour, feeling the weight of it, running my fingers over the NoteShel logo. Pure Bliss. It's colourful, it's magnetic, it's mine. The case itself is part rubber, part plastic and I could tell immediately that this NoteShel is durable and built to last. The post it slot is refillable so I can change it up a bit with extra colour. The funky little magnetised pen clings the the NoteShel quite impressively and believe me when I say that no amount of shaking would persuade it to loosen it's grip.That pen knows where it belongs. So I had this fresh, unopened block of post it notes and I wanted to make sure that the very first mark I made would be an important one. In bursts the boyfriend closely followed by our son, both claiming to feel faint with hunger, insisting that the only thing that could possibly save them was a trip to the McDonald's Drive Thu. On any other day I would have refused to go until they finally wear me down with their nagging or they get bored and start rummaging through the freezer. But this wasn't any other day, this was NoteShel day. So I took down their order and got in the car. Not quite the important mark I was looking for but it would have to do. With the boy and manchild fed I could go back to giving the NoteShel my undivided attention. The unique looking ballpoint felt light in my hand and had no trouble with ink flow. The metal parts of the pen look attractive but together with the smooth round shape are slippery customers after prolonged use. But do you know what? It doesn't matter. 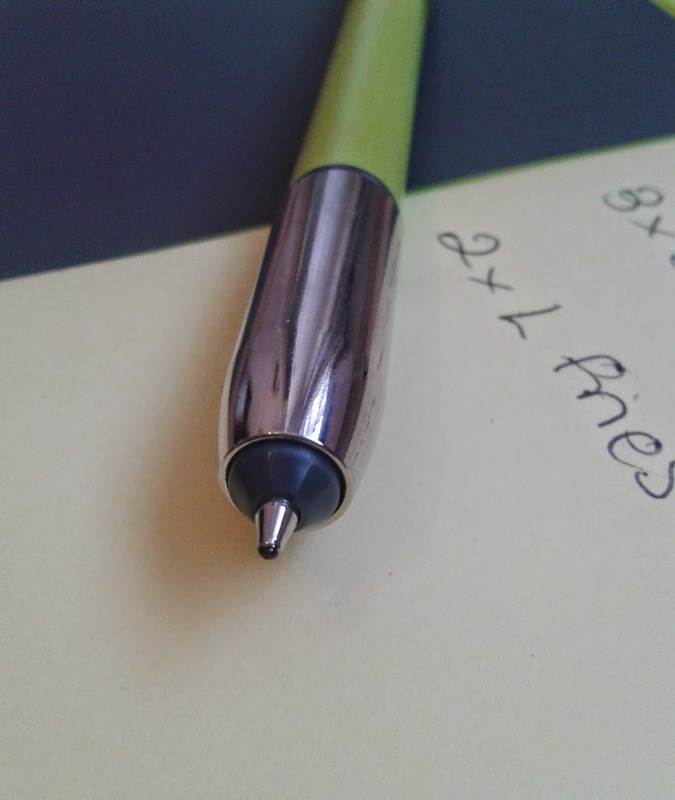 The pen isn't designed for prolonged use, it's designed for taking notes, for being there when you need it. I was especially pleased to find that this stylish pen is refillable. My NoteShel and matching pen will remain together, forever. As I popped the NoteShel in my handbag, smiling at how perfectly it fits into the zipped compartment, I noticed the tatty old notebook in the bottom of my bag and was overcome by a rush of mixed emotions. What would become of it? NoteShel has swooped in and taken care of all my note taking on the go needs. No more dog eared notebooks, no more digging deep for a pen that works. Does this mean I never need to buy another pocket notebook? Of course not! Once a stationery addict always a stationery addict and if there's one thing a stationery addict is good it, it's finding a use for yet another notebook.